An ice dam is a formation of ice that is located at the edge of a roof. Ice dams are an unwelcome attraction on your roof and can cause severe problems if left untreated because they prevent melting snow from escaping off the roof. This backed up water is prone to causing leaks because it causes 24/7 severe weathering directly to the surface of the roof. Ice dams can be a very big problem and if left untreated can be expensive to fix. I’m standing is usually caused by improper ventilation of your attic space and often has to do with below-average levels of insulation or uneven insulation along the roof line. If you are experiencing I standing, that is a very clear sign that you are experiencing heat loss in the Attic during the winter months from some facet of your roof and obviously this is costing you money. The perfect mix of roof style, heat loss from a roof, snow, and external temperatures cause ice damming. Obviously, ice dams can only occur when there is ice and snow on your roof, but just as important is the difference in temperature between the external and internal portions of the house’s roofing material. The eaves of a roof are the portions of the roof that extend beyond the house’s primary structure, are self supported, and often contain soffit underneath. Soffit contains small venting holes that are designed to conduct the flow of air into the attic – this air should then be continuously circulated by escaping through a ridge vent. When your ridge vent (or ventilation fan) is malfunctioning or doesn’t exist in the first place, this can lead to the types of temperature conditions required for ice damming to occur. Please periodically refer to the diagram above if you are confused. When the outside temperature is just below freezing (20 degrees in the diagram) and your ridge vent is not circulating air efficiently, the warm air from inside your home rises and increases the temperature of the upper portions of your roof (closest to the ridge) while the cold air from outside maintains slightly below freezing conditions underneath the eaves and slightly into your attic. Why are Ice Dams so Bad? You’ve likely seen ice dams before and haven’t thought much of them. But you should. They may seem like a small issue at first but I’ve personally seen them lead to tens of thousands of dollars in structural damage to the home. Although ice damming is not a good thing, you should be thankful of such a clear indication that something is wrong with your roof. This one is a no-brainer. Obviously there is a potential structural issues there just due to sheer weight, but also the ice that is laying there degrades the shingles at a much faster rate. 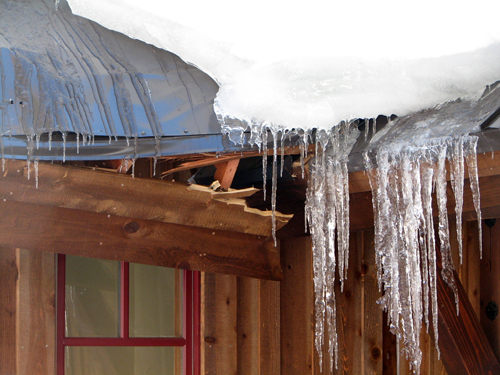 Ice Dams are a bad sign because they not only cause direct damage to your roof, but are also a direct indication that either your roof wasn’t installed properly or there are multiple failures that have occurred in your roofing system. This doesn’t necessarily mean that you immediately need a new roof, but it does minimally mean that you need to take some level of action. 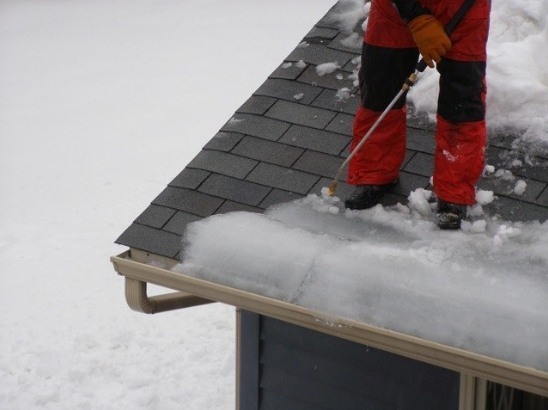 The first thing that you should do in response to ice damming on your roof is to remove the snow from the affected areas and attempt to remove any ice that you can while not causing any harm to the underlying shingles. The next thing that you should do is inspect your roof to identify the root of the problem. If you don’t figure out exactly what caused the first ice dam, you are highly likely to get another given the same weather conditions. Look for insulation that is pulled over your soffit, clogged ridge vents, failed ventilation fans, and any obvious failures in the roofing system. If you have an ice dam, your roofing situation is serious and we highly recommend having a professional inspect your roof and make the appropriate recommendation. In the event that you notice an active leak due to the ice damming, the level of seriousness has just raised to emergency status. Immediately contact a professional then get on the roof and start getting the snow off. Create channels through the ice dam to allow the water to be drained from the roof and away from the spot of leaking. Note however that this is only a temporary fix. In the long term, you must make sure that the difference in temperatures between the air in your attic and the outside air differ by no more than 15 degrees F. As a rule of thumb, your ventilation system should be effective enough that it allows for the complete circulation of all the air in your attic 2.5 – 3.5x per day. If you have soffit, make sure that there is nothing obfuscating the vents such – we commonly see insulation being wrongly applied over the soffit. Tightly seal the space between your house and your attic. Adding an extra layer of insulation to the attic floor or ceiling is a great way to reduce conductive heat loss.